The kafta is like a mini-burger, or a flattened meatball, using both ground lamb and beef to form the base, and it is a staple in Lebanese households. Now it can become a staple in your Keto household too, though it isn’t necessary to be on a low-carb journey to enjoy a kafta burger, not by any means. And this particular burger is so full of fresh mint and parsley that you will feel great when eating it – what’s more, you can wrap and serve it in a lettuce leaf for even more of that vibrant green feeling. 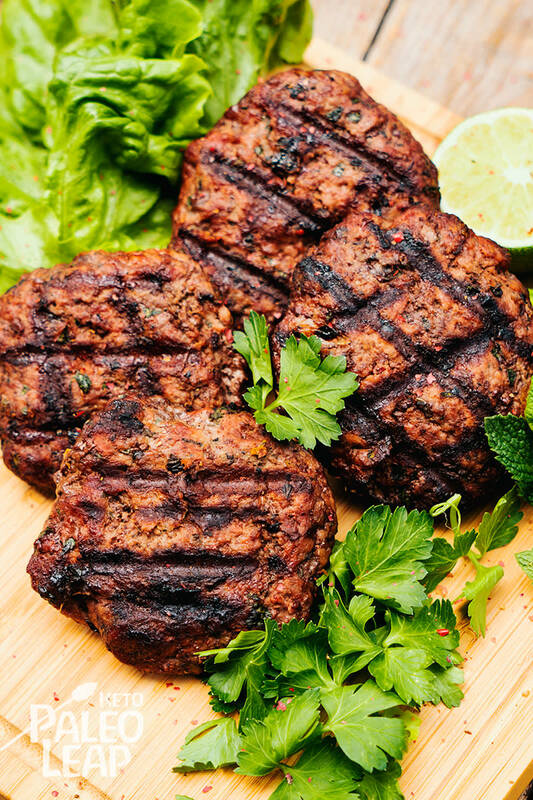 While it is entirely possible to choose your favorite protein (lamb, beef, pork or chicken) to make a keto burger, to be authentically “kafta” you will want to choose a 50/50 mixture of beef and lamb. It’s the classic combination and you shouldn’t mess with that. Make sure that all the spices are in there too, including the fresh ginger and garlic; a large pinch of garam masala adds a modern twist of incredible flavor. Best of all, dinner is ready in under half an hour, leaving you plenty of time to come up with a keto avocado egg salad, complete with homemade mayonnaise. Serve these kafta burgers with homemade tzatziki (cucumber, olive oil, fresh mint, garlic, Greek yogurt, sea salt and freshly ground pepper to taste). To make it dairy-free, simply replace the yogurt with more Paleo mayonnaise or coconut cream. In a bowl combine all the ingredients, except lettuce and lime; season to taste. Use your hands to form the burgers, and let sit 4 to 5 minutes. Place on the grill and cook 4 to 5 minutes per side, or until desired doneness. Serve with lime wedges, lettuce leaves and homemade tzatziki if desired.